Like it or not, the world is sinking. If the predictions play out, the rise in sea levels is going to make a big difference in communities around the world soon. Places like Wall Street, Miami, Shanghai, and Cape Cod could be completely underwater in less than a hundred years. 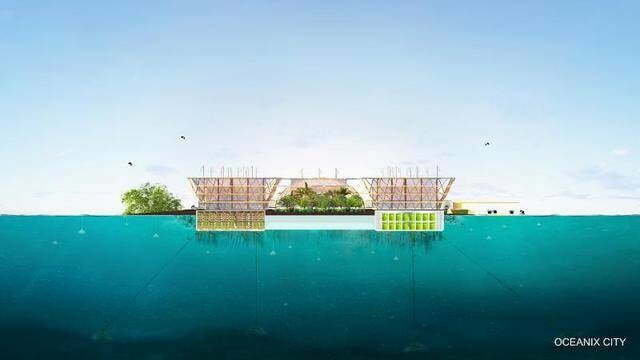 This month though, a bizarre but brilliant idea was introduced at the United Nations by an entrepreneur who hopes to save humanity by building floating cities that use smart technology, extreme recycling, and a futuristic plan to build floating islands that could be moored to the ocean floor. 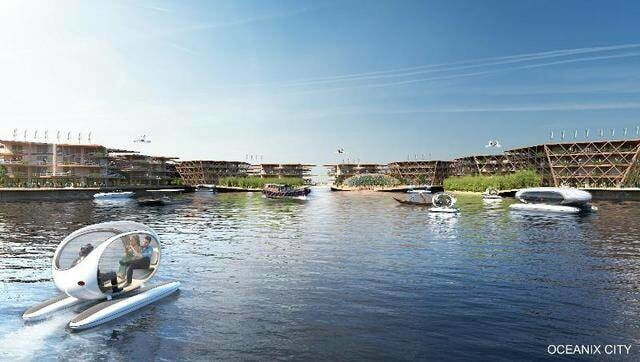 The idea is to build hexagonal floating islands about the size of three football fields to house something like 300 people and then link them to form self-sustaining communities. 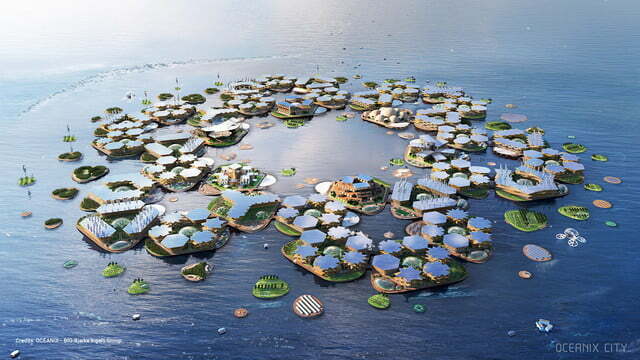 Hook a bunch of these floating islands together, with each having a communal purpose, and suddenly you have a village, which the creators say could eventually total some 10,000 residents. The concept comes from entrepreneur Mark Collins Chen, who was formerly the minister of tourism in his native French Polynesia, which is definitively on the list to sink in the next few decades. 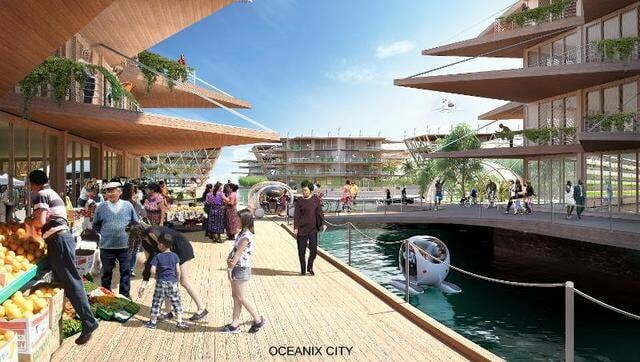 Last year, Chen formed a company called Oceanix to examine, theorize, and build off-shore urban infrastructures to help mankind weather the coming storm. There are two big differences between Chen’s concept and plenty of other ideas for alternatives to land-based communities. The first is scalability: if Oceanix can make one island, the experiment could theoretically be re-created over and over again. 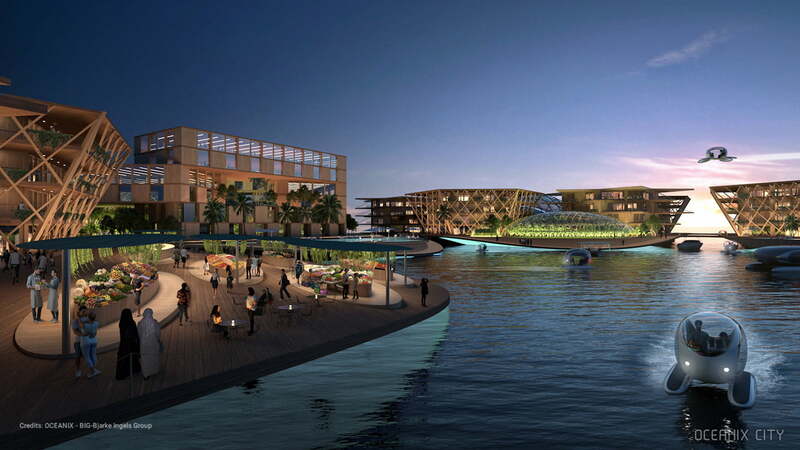 The second difference is that Chen’s concept includes a very clear plan to anchor these floating communities about a mile off the coast of major global cities. 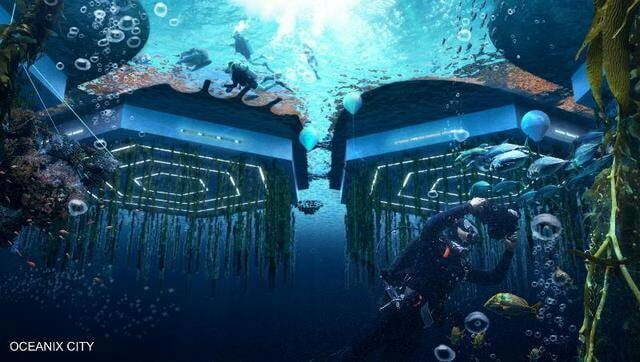 Specifically, Chen and Ingels want to use a material called biorock, which uses small bursts of electricity to stimulate the growth of limestone from ocean mineral deposits — a real-world concept that is not only ecologically friendly but is also currently used to foster the growth of coral reefs. The other cool thing is that Chen and his team have pulled in a bunch of smart people to tackle the essential problems. This is basically Battlestar Galactica with the advantage of water. Food? 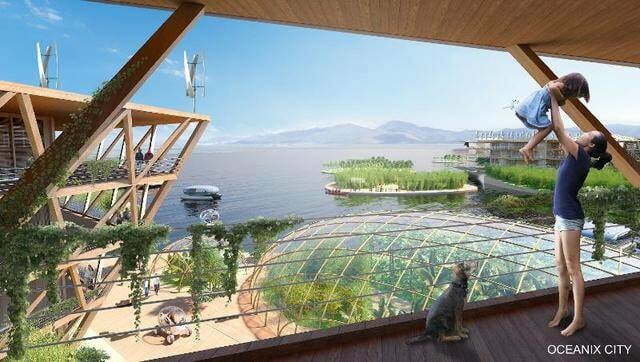 Let’s grow it, using outdoor vertical farming combined with hydroponics and aeroponics and, of course, beans. Greywater recycling? check. Extreme water recycling including water desalination? check. Hydroponics, aeroponics, sustainable transportation, and a platform that can potentially withstand a nightmarishly violent hurricane? check. Pneumatic trash tubes to flush garbage to a sorting station to identify and repurpose stuff? check. Big picture: it’s a pretty cool idea. 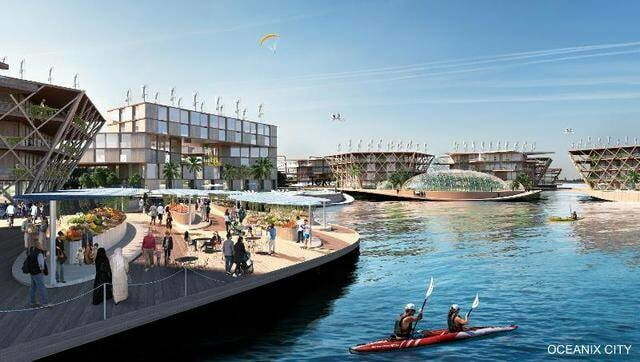 When you zoom out, Oceanix envisions a central open port with each “island” featuring important areas to meet the need for healthcare, education, spirituality, exercise, culture, etc. If a place sinks, Chen’s idea gives people a place to go, whether it’s temporary or permanent. The idea was unveiled at the First UN High-level Roundtable on Sustainable Floating Cities, which while being kind of scary, was convened with Oceanix, MIT, the Explorers Club and UN-Habitat, a United Nations offshoot mandated to work on the problem of, you know, preventing cities from drowning and stuff. Chen is bold in his predictions. “We’re not just theorizing. 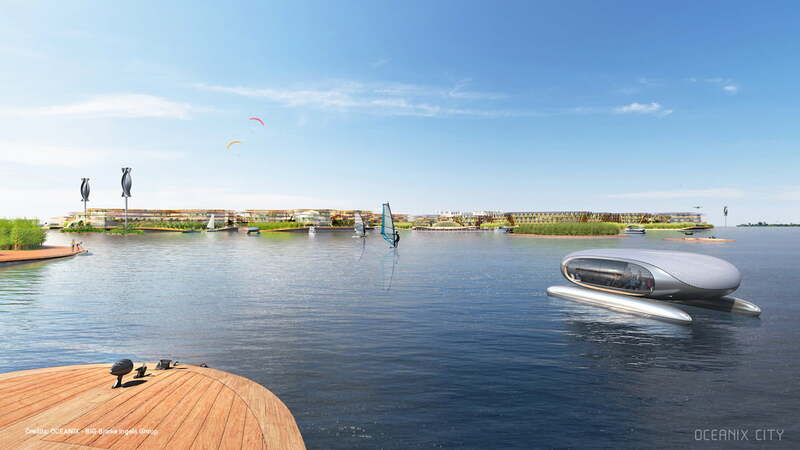 Everybody on the team actually wants to get this built.” To that end, the first step would be producing a prototype of this artificial island located on New York’s East River. There’s been some concern that some of these enterprises are attempting to create refuges only for those who can afford it, but Chen says that’s not the goal of this initiative. Hyundai unveiled the 2020 Venue at the 2019 New York Auto Show. It's a city-friendly car that stands out as the smallest and most affordable member of the company's crossover and SUV lineup. Small doesn't mean basic, however. Ring is helping the issue of smart home fragmentation with its Works With Ring program. It lets thousands of smart home devices built on Z-Wave connect to Ring's Alarm Base Station. Philips Hue expanded its Google Home integration through the Gentle Sleep and Wake routine. Just give Google the proper instructions are your lights will brighten or dim over half an hour.